I love big claims… the world’s best pizza, burgers, etc. 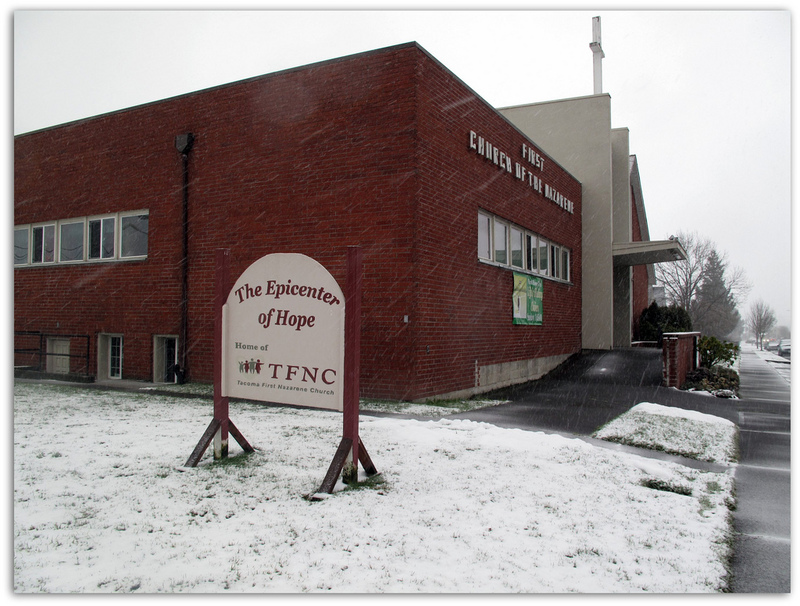 I love that Wallingford claims to be the center of the universe and I also love that Tacoma’s First Church of the Nazarene at 3640 South M is the Epicenter of Hope. So on this snowy day I drove over to the church to snap a photo. Their sign says that they have English and Latino Gatherings and that there is a Samoan Service at 2:00 on Sundays. This entry was posted in Churches, Places of the Spirit, Tacoma, WA State - Pierce County and tagged Church, English, Epicenter, Latino, Nazarene, of Hope, Samoan, snow, South M., Tacoma on January 15, 2012 by admin. The epicenter of hope! Wow, that’s some claim. I guess I’m way out on the fringes then. 😉 Great capture– the weather enhances the rather bleak physical trappings of all that spiritual enthusiasm!